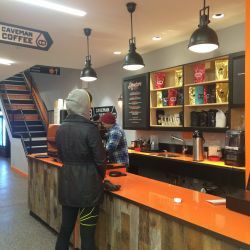 New York City, United States (IBwire.com - April 05, 2016) BRICK Grand Central opens paleo friendly coffee bar and the first Caveman Coffee Cave in New York City. New York City - February 16th, 2016. Popular fitness gym BRICK partners with Caveman Coffee Co to open a paleo friendly, third wave coffee bar in Midtown East. While it is a full service coffee bar offering espresso and lattes, the paleo friendly approach to coffee provides a unique and healthy alternative to traditional coffee drinks. The location plans to attract both paleo fitness and coffee enthusiasts, offering only single origin coffees from Colombia, Ethiopia and Brazil that are master roasted and specialty coffee grade. Paleo and Ketogenic diet followers eliminate inflammatory foods from their diet, improving health and increasing body performance and capabilities. Studies show that complex carbohydrates such as grains and starchy foods as well as some dairy products such as processed milks, can lead to inflammation, which ties in with many chronic illnesses and lowered body capacity. Adding butter and coconut or MCT oil to coffee, in lieu of traditional dairy, has been growing in popularity for the added health benefits. While the coffee bar at BRICK offers varied coffee drinks, its focus on the “Caveman Blend,” a paleo latte of sorts, will make this a destination for the thousands of people in the city who subscribe to these diet parameters. The third wave coffee movement is an artisanal approach to coffee harvesting, processing, and preparation, starting with the farm and ending with the roasting and brewing techniques. Third wave coffee beans are generally single origin and specialty grade, scoring at least 80 points on a 100 point scale. The growing, harvesting and roasting processes are within the top 25% of all coffee standards in the world. The quality-driven focus of third wave producers has resulted in the improvement of farming, processing and roasting standards. The increasing direct connections between the farmers, traders and roasters, has contributed to growing access to specialty coffee, worldwide. BRICK Grand Central is one of 3 BRICK branded gyms in the NYC area. Its first location in Chelsea has been open since 2013 with the most recent location in Brooklyn opening alongside the Grand Central location in 2015. BRICK is a luxury Crossfit gym with roots in Los Angeles, California and locations in NYC, Boston, Chicago, Spain and Kuwait. Their model offers functional movement and elite programming for any level of fitness and their wide variety of classes are set up to help the general community reach their health and fitness goals. Caveman Coffee Co is a coffee brand focused on offering single origin coffee beans roasted by a certified master roaster. They offer only specialty grade coffee and sustainable nutrition products that cater to a healthy diet and maximum human performance. Their products are tested for nutrient density and are elite for sustainability. Caveman Coffee Co MCT oil is 100% coconut derived and tested for heavy metals to ensure it is the highest grade MCT for optimal performance as a nutrition supplement.